A common problem is repetitive stress injury (RSI), also known as cumulative trauma injury. The most well-known RSI is probably carpal tunnel syndrome, which causes pain in the wrist and forearm. However, carpal tunnel is only the tip of the RSI iceberg. Other repetitive injuries include thoracic outlet syndrome, DeQuervain's syndrome (inflammation of the thumb muscles), tendonitis (such as tennis elbow), and ligament injuries. Repetitive stress can cause problems in your hands, wrists, forearms, shoulders, neck, or back. Runners, heavy lifters, or other people who stress their legs and hip joints can have repetitive stress problems in their hips, knees, ankles, or feet. Prevention includes using good body mechanics for any activity, including good computer ergonomics (discussed later), varying activities as much as possible, and taking frequent breaks from repetitive activities. Any repetitive activity, be it work, hobby, or sport, can potentially cause injury. In my massage practice, I sometimes heard people say, "I’ve been doing this [insert activity] for years and it never hurt before." That is the nature of repetitive stress injuries; they develop slowly over time. Some people are more susceptible to injury than others. Chronic tightness, discomfort, stiffness, or pain in any part of your body, especially your hands, wrists, fingers, forearms, elbows, neck, shoulders, or back. Tingling, coldness, or numbness in any area. Clumsiness or loss of strength and coordination in your hands. How Can Massage Help RSI? Carpal tunnel and thoracic outlet syndromes involve nerve compression. What is compressing the nerves? In most cases, tight muscles. Massage releases muscle tension, which relieves the compression and pain. Regular stretching can also help. In other RSIs (such as tendonitis or ligament injuries), muscle, tendon, or ligament fibers are torn. Specific massage on the injured fibers speeds healing by breaking up adhesions (stuck together tissue) and excess scar tissue and by increasing circulation, which brings in nutrients and removes waste products. Regular massage can help any problem caused by tight or injured muscles or injured tendons or ligaments. Consider massage before resulting to more drastic treatments. Do realize it’s not a miracle cure and requires a regular treatment schedule. You must also take responsibility for stretching and making any needed changes in your activities. 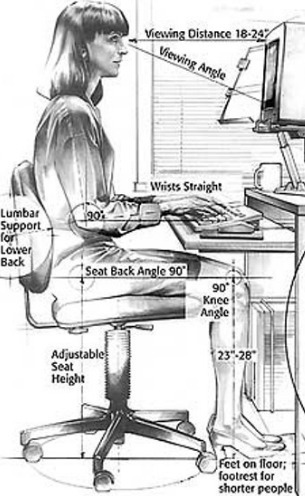 Position your chair and keyboard so that your forearms and upper legs are parallel to the floor while you are typing. Place your keyboard at a height where your wrists are straight and level while you are typing. Position the keyboard near you to avoid stretching forward to reach the keys. Also, avoid reaching for the mouse by keeping it near the keyboard. Keep the joints at your hips, knees, and ankles open 90 degrees or more. Keep your head in alignment with your spine. Let your neck relax and imagine your head floating up to the ceiling. Let your upper arms hang straight down close to your sides, with your elbows bent at a 90-degree angle. When typing, relax your wrists, and avoid bending them up, down, or to the sides. Bend your wrists forward and backward and then circle your hands. Let your head hang forward and gently move it from side to side. Lift your shoulders, circle them forward and then down and back. As you work, imagine breathing into your arms, neck, and shoulders. Focus on staying flexible and relaxed. Stop typing frequently, let your arms hang by your sides, and take several full breaths. Make sure your hands and arms stay warm. Cold muscles and tendons increase the risk of overuse injuries. Avoid reaching far forward or twisting behind you to get things. Instead, stand up, or turn and move close to retrieve the item. If you need more support, research products that support computer ergonomics.